OptiGene’s Isothermal Mastermixes allow real-time fluorescence detection of amplified DNA and RNA on the Genie® II and Genie® III platforms. Mixes are also suitable for generic qPCR instrumentation. An anneal curve can be generated post amplification to confirm the amplification product; eliminating the need for gel electrophoresis or turbidity detection; essential for a closed-tube system. Isothermal mastermixes are suitable for end-point detection but this practice is strongly discouraged due to the extremely high probability of contamination when opening the reaction tube. OptiGene’s isothermal mastermixes are fully licensed for LAMP by Eiken Chemical Company. OptiGene’s isothermal mastermixes are suitable for alternative isothermal amplification technologies. Proprietary and patented reagents offer the fastest reaction times available. OptiGene’s DNA polymerases are also available separately. 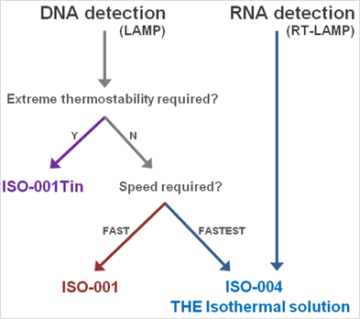 ISO-001 *** ** * FAST isothermal amplification of DNA and RNA – just add primers and template. ISO-001nd *** ** * Fast isothermal amplification of DNA and RNA – just add primers/template. This mix does not contain a fluorescent dsDNA intercalating dye. ISO-DR001 *** ** * Fast isothermal amplification of DNA and RNA – just resuspend and add primers/template. Highly stable freeze-dried mix. ISO-004 **** *** * FASTEST isothermal amplification of DNA and RNA – just add primers and template. ISO-004nd **** *** * Fastest isothermal amplification of DNA and RNA – just add primers/template. This mix does not contain a fluorescent dsDNA intercalating dye. ISO-DR004 **** *** * Fastest isothermal amplification of DNA and RNA – just resuspend and add primers/template. Highly stable freeze-dried mix. ISO-DR001Tin ** - **** Highly thermostable enzyme suitable for isothermal amplification of DNA – just resuspend and add primers/template. Highly stable freeze-dried mix.